RDG Filings was happy be at the recent XBRL-US Conference in Las Vegas on 23-25 September. As in years past, the conference provided an invaluable forum for the exchange of ideas from people across the entire XBRL spectrum. It was exceptionally informative, and the primary takeaway—from all perspectives—is that the quality XBRL data will be improving. Daryl Issa, the Chairman of the House Government Oversight Committee, began the proceedings with a recorded statement that continued the themes of the critical letter he had written to the SEC only two weeks prior to the conference. Craig Lewis, the SEC’s chief economist and director of the Division of Economic Risk and Analysis, which oversees the SEC implementation of XBRL, followed with comments of his own that addressed the criticisms that had been lobbed at the SEC regarding data quality and enforcement. Lewis discussed the Accounting Quality Model (aka: AQM or “RoboCop”), which is an analytical tool that will trawl corporate filings to flag high-risk activity for closer inspection by SEC enforcement teams. In order to protect the “deterrence factor” of the tool, Lewis assiduously avoided giving details with regard to how RoboCop will work and what precisely it will be looking for. He made clear that he did not want to give away any secrets about the tool to protect against the discovery and exploitation of potential loopholes. When asked directly how companies can avoid being flagged by the RoboCop model, he would only go so far as to suggest that companies be sure to review their XBRL data prior to submitting it. He did say, however, that RoboCop will “not be a static model,” but rather will continually be updated and improved over time. After these two introductory statements, the theme for the remainder of the conference was established, and for information you can see more of the presentations and panels here. The theme was XBRL data quality. The SEC itself talked about their mechanisms for enforcing enhanced quality, analysts and other end-users of XBRL data discussed the varying usability of shabby versus quality data, and there were a number of sessions on the proper creation of XBRL code. RDG was very happy to be at the conference both to continue enhancing our expertise and to introduce our XBRL Quality Assurance Services. 4) Full set of easy to read reports and consultation with your XBRL expert CPA to review findings. RDG brings something vital to the table that most audit firms do not. We offer the manual CPA review of your XBRL filings, but we also have years of experience actually constructing XBRL filings. That experience gives us knowledge and expertise to more effectively de-construct and review XBRL filings than an audit firm that has never created an XBRL filing. 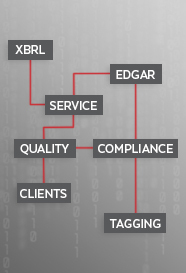 RDG’s CPA expert will thoroughly analyze your filings, applying the regulations established in the EDGAR Filing Manual and adhering to XBRL best practices as established by the FASB, the AICPA, and the XBRL-US Consortium in order to ensure precision and compliance in the four primary aspects of XBRL filings: Accuracy, Completeness, Mapping, & Structure. Additionally, we will also work with you to clearly explain our recommendations and work with you to implement those changes. Please get in touch with any questions, or if you’d like to setup a call or demonstration to learn more about what we can do for you.